- No Smoking indoors - but outside is cool with us. - Be conservative with water usage. - Switch off the AC and lights when heading out. - Finally, you are strictly required by us to ... ENJOY YOUR ISLAND HOLIDAY! Should you have any more questions about staying with us, please don't hesitate to ask. We hope you enjoy your stay at Kupu Kupu Cottages on Gili Trawangan! Conveniently located in the heart of Gili Trawangan, our cozy garden cottages are an ideal place to relax and enjoy your island holiday. A perfect option for guests seeking clean, comfortable rooms at a great value. Enjoy Hot Water, AC, and WiFi. Enjoy your complementary breakfast served to you on the terrace- featuring western and local selections and fresh fruit from our garden when available. Whether you pack your day with activities, party the night away, or simply laze the day in the comfort of your hammock, Kupu Kupu Cottages are the perfect base for enjoying all that the Gili islands have to offer. No hidden taxes or service charges and nothing is off-limits. Make yourself at home! 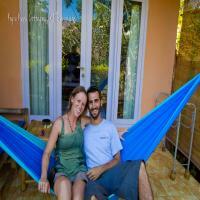 Your hosts, Udin and his wife Morshia have been guiding and hosting visitors to the area for more than fifteen years. They are both extremely knowledgeable, helpful, and Udin speaks great English too. We (Jen and Matt) will be able to help you online with your booking process, arranging transportation, boat trips or trekking, while Udin can help arrange day trips upon request. The Gili Islands are three small islands dotted with coconut groves and surrounded by warm, clear seas and vibrant coral reefs. The largest and most popular of the three islands, is Gili Trawangan, located less than 10 minutes by speedboat from mainland Lombok. This little island combines the best of a tropical island lifestyle with the facilities and services to make an ideal holiday getaway. There is excellent snorkeling and diving off the coast, soft white sand beaches for swimming and sun bathing, a fantastic selection of restaurants and bars for dining and socializing, and a lively nightlife scene at night. Although Gili Trawangan was once strictly a destination for budget travelers with a "party island" reputation, it’s visitors now cover a wider range visitors than ever - accommodating luxury travelers, families with children and couples on romantic getaways as well as the backpacking set. Whether your holiday focuses on scuba diving courses, horseback riding, fishing, mini-golf, yoga, or simply relaxing on the white sandy beaches, this is the perfect place to sit back and soak in the sweet island lifestyle. There are several options available to the Gili islands. By far the fastest and easiest way to arrive from Bali is by fast boat, which will deliver you directly to the jetty in Gili Trawangan, just minutes from our doorstep. We are happy to offer discounted fast boat tickets to our guests who are interested. One of the best features of the Gili islands is that no cars or motorbikes are allowed, making the Gili islands the perfect place to get away from the hustle and bustle of the busier areas of Indonesia. Kupu Kupu Cottages are conveniently located just a few minutes walk from the best beaches, shops, and restaurants that the island has to offer. You can just as easily reach the harbor, night market, sunset viewpoint , or the top of the Panoramic Trawangan Hill from our ideal central location. Nothing on the island is too far to reach by foot, but renting a bicycle for the day is an easy and affordable option to leisurely explore the island. Just ask our staff about renting our cottage bikes. WE ARE LOOKING FORWARD TO HOSTING YOU HERE IN PARADISE!